Normally, I try to stay away from games that one side cannot win outright. So, gaming the end game of World War II in Europe, especially 1945, is usually something that does not end up on my table. With these types of games, you have to do better than your historical counterparts did. Most of the time it is just holding a hex or hexes up until the end of the last turn, while inflicting more casualties on your enemy than was historically accurate. On the Soviet or Allied side you are trying to finish the war earlier than it did historically, or in this case taking Königsberg earlier and inflicting more damage on the Germans. You should not, as the Germans, in any game based somewhat on reality, be able to defeat the Russians in 1944-1945. You can only prolong the inevitable. However, I have even played games about trials so I will keep an open mind as I am playing. You could play the game as a three player one, with a player taking one of the 2nd or 3rd Belorussian fronts. The Russian player who has taken the most victory hexes would be the winner. That is, of course, if it ends in a Russian victory. 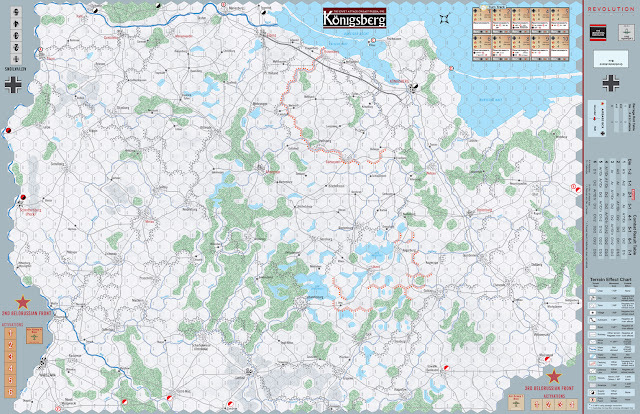 For those of you so inclined, there is also a Vassal module available. 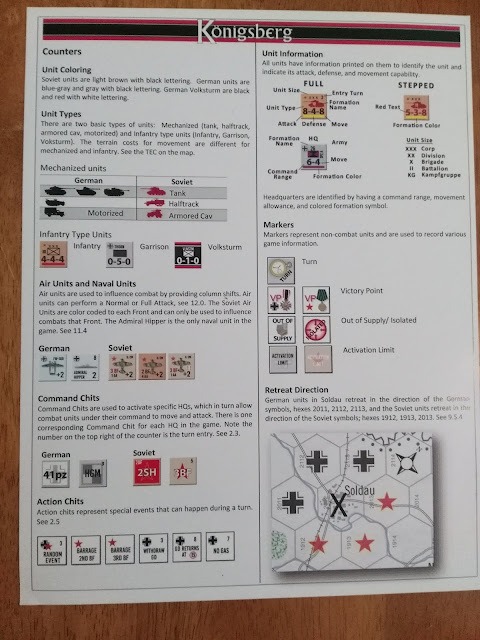 The game takes place in East Prussia and northern Poland from January 13th to February 1st, 1945. The number of turns in the game is ten. The playing time is estimated at four to ten hours. The scale of the game is five miles/eight kilometers per hex. The units will go from brigade to corps size. The solitaire suitability is listed as high. You will need to supply a six-sided die along with a chit pull container. The map is very well done, and is of high quality. The terrain and defenses etc. are clearly marked. Everything from the CRT to the turn record track is on the map. So it should be easy for almost all gamers to have a place to set it up. The game length, especially during the learning phase, will probably mean you will have to leave it set up for at least a day or two, depending upon your free time for gaming.The counters are 1/2", and are easily readable and compare to the best counters I have seen in a Ziploc or wargaming magazine. 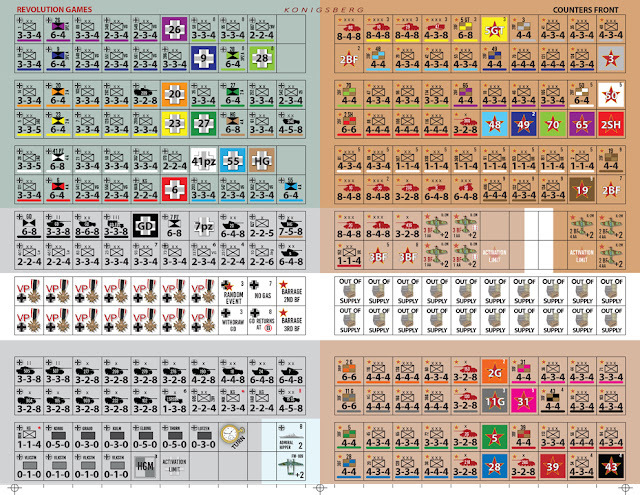 Depicted are Soviet Guards units, Volkstrum units, along with air units which are mostly for the Soviets, and the Admiral Hipper even shows up on the German side. 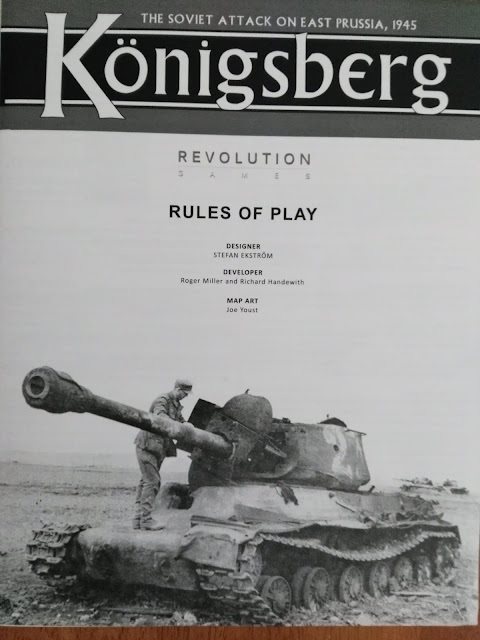 The rule book is in black and white, and it shows no examples of game play. On the other hand, the game rules are of a pretty standard fare for hex wargames, so unless you are a complete tyro you really don't need too much hand holding. The German player controls all his units, but the Soviet player is split between the 2nd and 3rd Belorussian fronts. 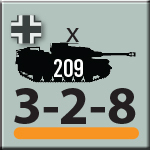 So the German player gets X activations each turn while the Soviet player gets activations for both fronts. During the chit pull, you will pull a Command Chit for whatever Headquarter unit, and then the sub-units of that force can move and attack etc. 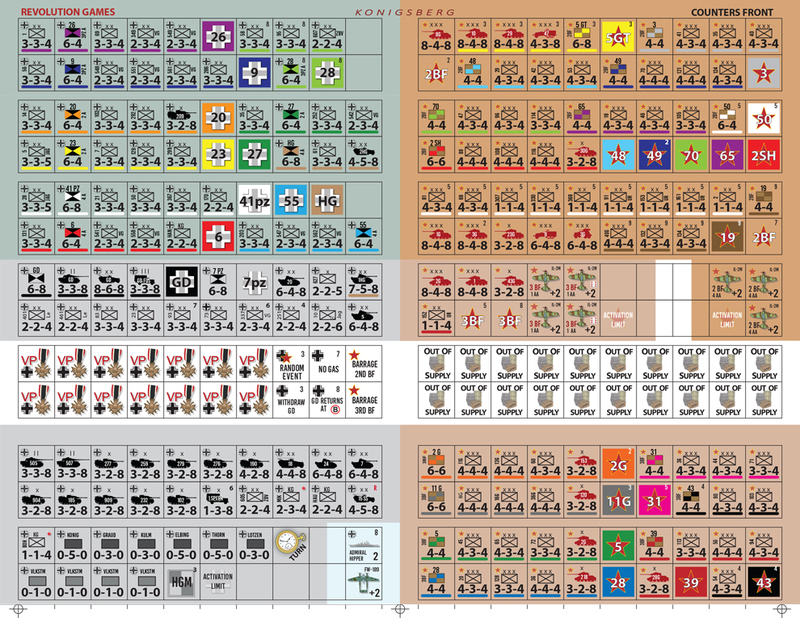 The game also comes with independent units on both sides. These can be activated by any active Headquarter unit in range, meaning that independent units can be activated more than once per turn. German HQ units can activate three independent units, while Soviet HQs can only activate two independent units. A HQ unit has their command radius listed on their counter. 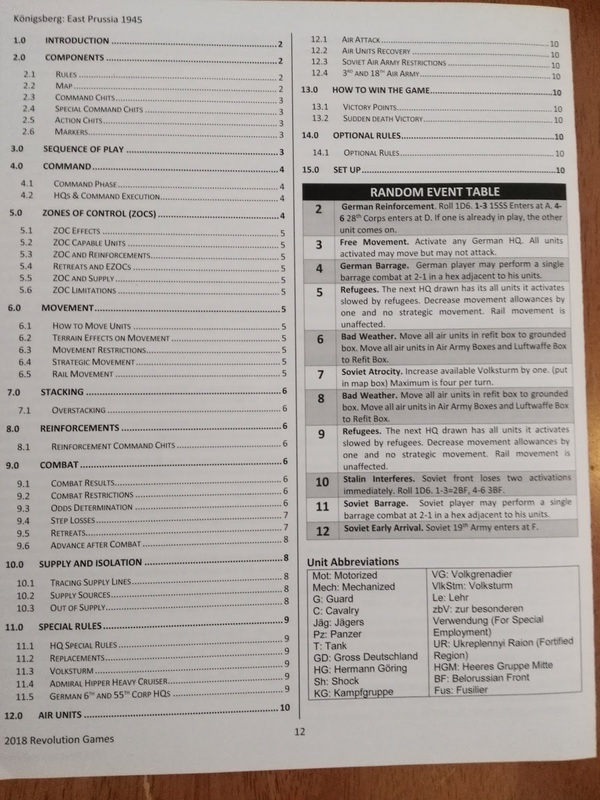 The way I read the rules is that you do not count the hex the HQ is in when tracing command. There are a few optional rules, ie. using the rebuilding 20th Panzer division, or two other small German forces. 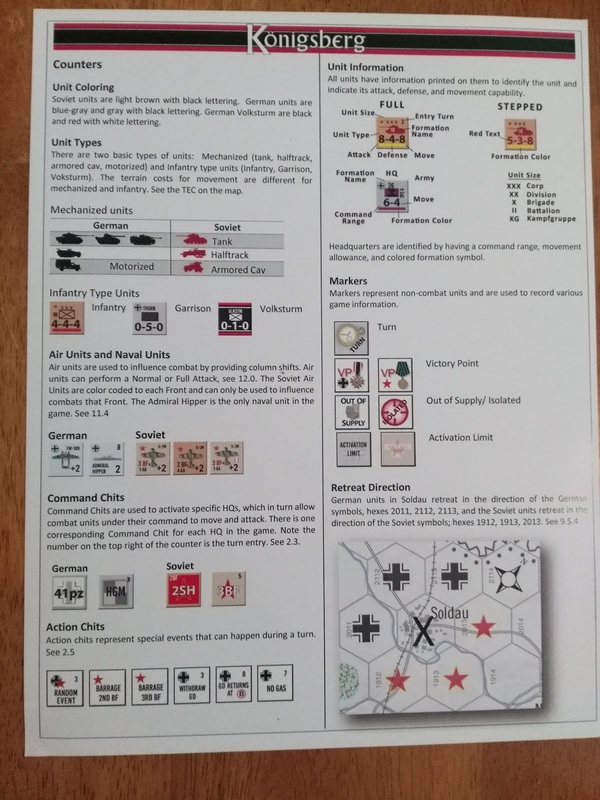 Within the last two years I have had to adjust my thinking about block wargames and a few other things. Once again, I have been shown the errors of my ways. Playing a wargame that you can 'win' only by the victory conditions is actually entertaining and still teaches you a good amount of history. Playing as the Germans, you will have to keep your wits about you, and accurately judge when to cut and run. Do you try to save those surrounded Panzers, or do you just make a defensive line farther back? 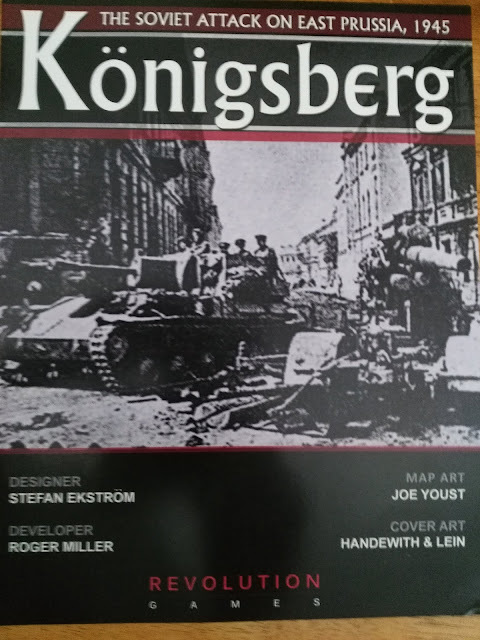 The Konigsberg area in East Prussia is where many of the German Junker (noble) families come from or at least are close to. The German officers were probably trying to save every inch from the Russians. Playing that way as the German player will have you beaten in no time. Playing as the Russians, you play pretty much historically. You can not even worry about casualties, and just keep storming ahead trying to overwhelm your opponent. I would think a nice touch to the rules would be the following: If the Russian player does not gain X amount of victory hexes in X amount of turns, that player gets a knock on the door from the NKVD and it is a German victory, just to give the Russian player that much more incentive. This is a good medium sized game, and relatively easy to play, about a much overlooked historical period. Anyone who wants to be in the German or Russian shoes in 1945 should give this a try. Equally, anyone who thought like I did about gaming lost causes should rethink this and other gaming possibilities.